I just walked in the door from the Summer Solstice Ambient Festival which was held in Harrisburg PA, and which featured performances from Jeff Pearce, Robert Rich, Steve Roach and Jonn Serrie. In a word...WOW! It was an absolutely incredible afternoon of some of the best ambient and atmospheric music I've ever seen. The afternoon started out with Jeff Pearce warming up the day with a truly inspired performance. Jeff's guitars never sounded better. Opening his set with some beautifully melodic pieces, Jeff segued into the more ambient, atmospheric portion of his performance which featured new music from his "Summer Solstice" CD written especially for the afternoon's event. Jeff's relaxed stage presence and good humor (I especially loved his good natured ribbing at event host John Diliberto) had the audience laughing and made for a truly wonderful set. Jeff ended his performance with an improvisational number where he solicited help from John Diliberto and the audience by asking audience members to help choose the key signature for his final piece. Then to make his last number just that more challenging, he cut 5 of his 6 strings from his guitar using a pair of wire cutters leaving him with just 1 string to compose his final number on! It was amazing! While Jeff was leaving the stage, a black Grand Piano was wheeled out from side stage and Robert Rich immediately took the stage. No breaks! 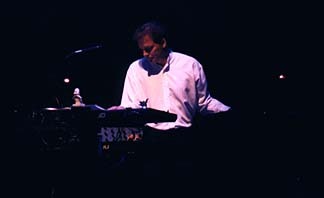 Robert's keyboard rig was truly impressive. 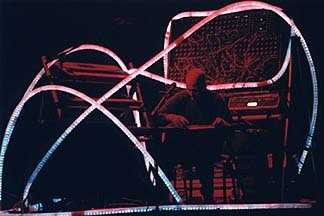 The center piece was this huge analog synthesizer reminiscent of the old Keith Emerson rig, with patch cords everywhere on a six foot tall board, a rack of keyboards on the audience's left, various monitors and computers, and a steel slide guitar on the right. 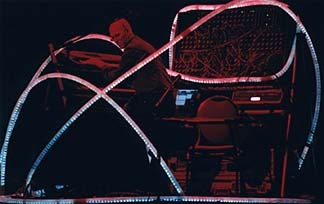 His rig was also surrounded by a light cage that resembled long lighted tubes that surrounded him and flowed amongst him and his keys. 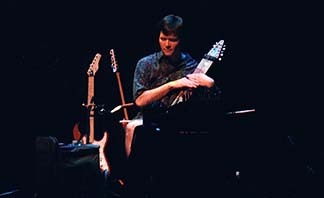 The performance began with John Diliberto interviewing Robert on stage about the various instruments he was employing, including the analog synth and steel guitar, while Robert demonstrated a few effects on the steel guitar. Robert began his performance with a solo on the Grand Piano. It was simply magnificent. He then shifted over to his electronic equipment. As drones of atmospheric music began to swell, Robert enhanced the mood with his flute and he never looked back. His performance ranged from the quite atmospheric to intense rhythmic passages which kept you on the edge of your seat the entire show. My favorite section of the afternoon was when Robert was playing his slide steel guitar during an especially energetic movement. It was one of those great performances you rarely get to see. It was over before you knew it and the audience loved it. A short break followed Robert's set where the audience could go to the lobby and visit the various tables that were set up for the artists. The dimming of the houselights soon began and the anticipation level rose. Steve Roach was next. Steve took the stage and gave a performance that just blew the roof off. 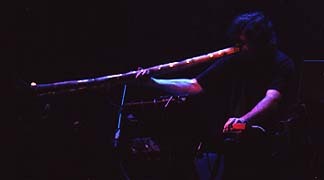 Beginning with the classic Steve Roach subtle sonic landscapes, the music just grew, and grew, until the energy level of his performance reached a fever pitch that was just incredible. Steve ended the performance with a short interview from the stage with John Diliberto. The final performance of the evening was Jonn Serrie. A beautiful sounding set, Jonn's song selection included songs from his classic cds such as "And The Stars Go With You", to his newest material and his forthcoming cd. Ranging in styles from the quiet ambient, to the sweet melodic, Jonn's gave a performance that satisfied all. After the show, all of the artists mingled in the lobby talking, taking pictures with audience members, and signing autographs. The event was a huge success as far as attendance went, (I bought my seats there and I was in the next to the last row upstairs), and the venue couldn't have been better. The sound system was perfect, loud and clear with no humming, buzzing or feedback, and the audience was just fantastic. Each song faded out until the very last note drifted off before you heard a sound from the audience. What an afternoon. Well, that's just my view of the day. Just my own small personal opinion of a fantastic concert event. Everyone involved should be congratulated and thanked. The venue is a relatively new theater that holds a little over 600, which was the perfect size. Good acoustics, and comfortable seats. I've seen a number of shows here, and was thrilled when I first heard about this one. Jeff Pearce was great, performing some newer material on the "Summer Solstice" CD he had made for this tour, and showing his great sense of humor between the compositions. My friend that I brought along has quite a crush on Jeff, and she even got him to autograph a copy of "Shores of Heaven" before the show started! She always keeps going on about how sensuous his music is, and I certainly have to agree. 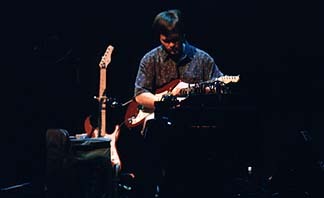 Jeff's willingness to have the audience pick the key for the final piece was cool enough, but to have him dramatically cut all but one of the guitar strings, and then perform on just that string, was showmanship that is rarely seen in any genre. And it was so appropriate. Robert Rich was next, and I was floored to hear in the interview segment that he credited one of the members of The Soft Machine (Daevid Allen) for using the lap steel in the way that creates that amazing ethereal "voice" that seems to call from another world. I'm a fan of the band's '60's albums, and never thought about it before. After the acoustic piano segment, he was inside his space (I wish there were pictures to explain his setup), bopping around at times like a kid in a candy store! When he got into that very still space, he seemed to have an almost Zen Master-like calm as he pored himself over the lap steel and synthesizers. Every time I've seen him, he puts into a very altered state of mind. I can't descibe it. During the break, my date & I zipped back to my place for a little food & drink before we headed back. As we were running up the steps, Robert Rich informed me that I had on one of the few glow-in-the-dark "Humidity" Tour 2000 T-shirts! How often does that happen? We got inside just after Steve Roach began, and he was already moving in to the deep... swirling worlds were being conjured, and it wasn't long before the room seemed like it was spinning. He almost appeared at points to be willing thoughts into the synthesizer, like an alchemist. The place was packed, and yet there were times you could have heard a pin drop. A very respectful audience indeed. Sure enough, the didgeridoo came out and took us even further into this deep, deep soundworld. After he was done, the fellow sitting next to us from Annapolis, MD just went, "Wow!" He was blown away, as all of us were. What a great way to introduce somebody to a great artist. Jonn Serrie sounded fine for the last set. Some material from the new one, of course, as well as some of his classic themes from "And The Stars Go With You". I thought it was nice of him to ask the audience at one point "More space, or more romance? ", giving us a choice. The roar of "SPACE" came back, and he continued right along. 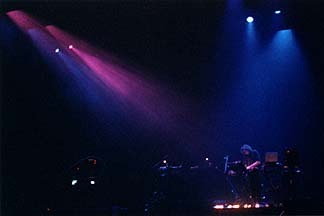 The lights were subtle for the most part, with Robert Rich drenched in red for his set, and Steve Roach in blues & greens for his. Jonn Serrie had a spotlight but asked the crew to turn it down, so he could be in a more exotic space! He eventually got the request, and the fog machine cranked in even more. It was all over before you knew it, and it was now SIX hours after the beginning of the show! I loved the crowd out in the lobby, lining up to get the artists to sign copies of CD's, and have their picture taken with them. I could only stop briefly to say hi to Steve Roach, but we continued our discussion from the last time regarding the psychedelic aspect of this music, and other really heavy subjects near & dear to our hearts. He is just so deep, and a truly nice person as well as an amazing sonic sorcerer. And I'm very grateful for an autographed poster that I got from him, which will be framed soon. Also got to say hi to Chuck van Zyl, and talk about plans for future Gatherings. He is just as laid-back as he is on the air. Even the lovely Andrea was there, radiating those great vibes that always greet you when you walk into the Gatherings (sigh). It was different seeing these artists perform in a theater, and not in the church setting of the Gatherings. Something to be said for either experience, I think. Floating down the road, my friend said this was the best date she ever had! And I have to admit, it was truly a spectacular event in spacemusic. My thanks to everyone who made this special day possible, including Mitzi Trossel of WITF, the Whitaker Center staff, John Diliberto & Jeff Towne, and of course Jeff Pearce, Robert Rich, Steve Roach and Jonn Serrie for making this a truly Spectacular event! Robert puts on a great show -- this is the third time that I've had the pleasure of experiencing his live performances, and he always has that unique spell that he casts. He has such an ease and calm about him as he plays, whether he's bopping around the synthesizer, or poring over the lap steel. The concentration he maintains is something else. He is transcendent is so many ways: the exotic sounds, his passion for very high quality audio, his ability to play so many instruments, his ethereal 'voice' that comes from the pedal steel, etc. Oh, and can't forget the bamboo flute! I just love the way he brings that in -- it's got so much texture and it just contrasts so well against the synthesizer. And the synthesizer is absolutely huge -- literally and figuratively! I wish there were pictures somewhere of his setup. The way he had the tube o' white lights all around it, creating a 'space' that he stayed in created quite an effect after he took us into that foggy, mystical, altered state -- I wish I could experience a full sleep concert sometime, but I'm grateful just for any appearance that he makes. I recognized the piece from the end of "Seven Veils", which has that unique percussion sequence which brought us back to earth at the end of his set. The fellow next to me (who had driven all of the way from Annapolis, MD primarily to see Robert) was all smiles, as I was. 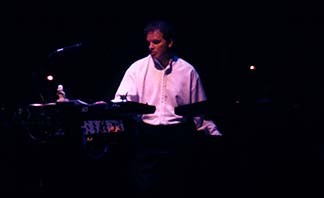 Robert is a true master of this genre, along with the others who performed at the show. And to have him touring, to be able to experience what he does live, after all of these years and albums is really inspiring to me. I had my car revved up almost a day ahead of time in anticipation of the show. Then when I suggested a 6 AM liftoff toward western "spaces", my son,who accompanied me, mildly retorted that Harrisburg was only two and one-half hours away. "State capital, my boy! ", I forewarned. "Could spell plenty of traffic and trouble." I had him out of bed and on the road by nine. Best he could do. Harrisburg was empty when we arrived. We're talking ghost town here. Images of Three Mile Island popped into my head, the ill-luck nuclear generation station just up the Susquehanna. Thankfully, I saw an old lady strolling upthe rolled-in sidewalk. "This really Harrisburg?" "Yup." "Where is everybody?" "Right here." "Free street parking?" "On weekends." "Cool!" In the entire huge business district there was one pizza joint open, everything else was gated closed. We headed in for a slice. The proprietor grumbled. We would have left, but we were really hungry ... after my insisting that we did not have time to stop for breakfast on the way. With a few hours still to kill, we strolled around the capitol building. Nice! Vacant! We danced around some cool fountains... Governor Ed's place... a former Philly guy. The only place "happening" in town was the Whitaker Center; a combo science/entertainment facility. If you ever happen across PA on her turnpike,stop in. You'll find here a planetarium, museum... and if you're *really* lucky you might catch the next electronic/space music festival. It's so nice to see the plethora of positive feedback here on the list in regard to the festival. Considering what transpired, both the promoters and artists involved deserve all the praise in the world. What impressed me the most was the informal approach... livingroom-style... brought to the table by John Dileberto, which certainly offered those of us there an opportunity to gain added perspective into each musician and his music. Jeff Pearce would simply captivate his audience with his combination of ballads, ambient pieces and his warm, humorous personality. Three pieces from his gorgeous "Summer Solstice" release were incorporated into his set. I have to say here that this CD would go directly into the player when we left Harrisburg on the road back home. Crossing back over the Susquehanna River at sunset... shimmering water, shimmering music... managed to magically put the entire day in a broad perspective; representing the outset of an ongoing period of reflection. Robert Rich's fast-fingered piano performance revealed a depth of musical talent that spans beyond what many of us realized. His segue into the known Robert Rich-world of sound was as smooth as ice. The opening 10 minutes of "Propagation" preceded a journey through some more recent compositions... all culminating with "Seven Veil's" "Lapis", which would bring many to their feet. Steve Roach took us on a predawn, almost nightmare-like didg-and-guitar enhanced journey to the deepest realms of the universe. Jonn Serrie used his muse of the stars to steer us all back home. Serrie's spacial themes were most lovely. The festival served as all very well. As the day concluded, I was overcome by the warmth of having shared a special occasion with many a kindred spirit. This is certainly not the first time this has happened... the magic of the Gatherings series has created that special "space" time and time again. We should *all* keep going back. Yes, John Diliberto was a great emcee for the proceedings. He made everything feel very relaxed and somehow managed to make all of us in the theater feel like we were in a living room concert. The interview segments were short, but packed with info. I don't want to give everything away, but it was very interesting to hear why Steve Roach got involved with guitar, and why he sometimes only has a few strings on it, etc. I still can't get over Robert Rich's revelation about the group Soft Machine (Daevid Allen). And of course, Jeff Pearce had everybody in the place cracking up with his great sense of humor. There was so much going on that I didn't have a chance to chat with John -- I'd love to hear about the early days of the Star's End radio show, the Philadelphia area scene, all of the travel involved with Echoes, all of the artists, etc.